To order a signed copy of Lovely, download this order form or click the payment button below. For each book ordered in this way, Lesléa will donate $1.00 to the Matthew Shepard Foundation so that they can continue the fine work they do to erase hate and replace it with acceptance, respect and love. 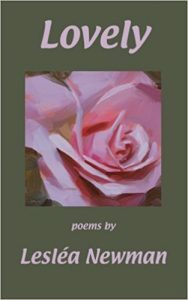 Lovely is an eclectic poetry collection that takes the reader on a journey as the speaker of the poems travels from childhood through young adulthood, to finally become a “woman of a certain age” who has gained insight and wisdom along the way. Many subjects are touched upon including loss of innocence, mother/daughter relationships, aging, self-acceptance, grief, the sharp pain of violence against women and the LGBTQIA community, and the deep pleasure of long-term love. Written with Lesléa Newman’s signature passion and wit, these well-crafted and accessible poems are full of startling, poignant, and powerful imagery and will stay with the reader for a long time to come.